Earlier in 2015, The Grilled Cheese Truck donated to the Orange County Rescue Mission, a non-profit organization helping the homeless become self-sufficient. Later, Tustin Buick GMC and the American Food Truck Group president Mark Parkinson connected with Rescue Mission president Jim Palmer and proposed a collaboration: in the Rescue Mission's 4,879 square-foot kitchen, they would train veterans to run a new Grilled Cheese Truck operation, and they would get paid more than minimum wage. Having spearheaded an initiative for veterans a few years back, Palmer loved the idea. 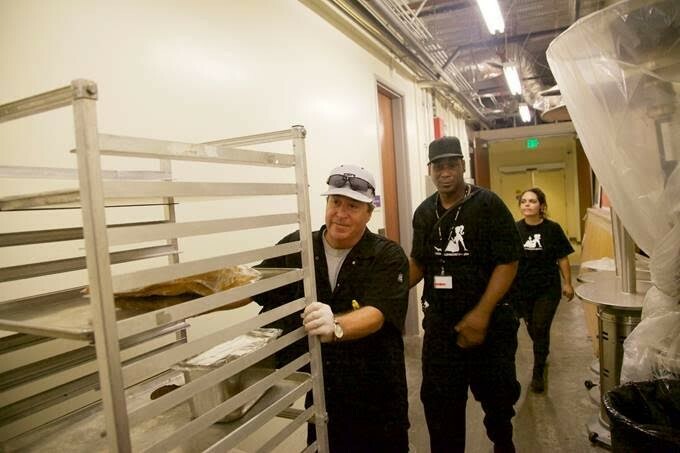 Soon after, the veterans began training in the kitchen. Palmer notes that Orange County has the sixth largest concentration of veterans in the country. In addition, a study released this year says many veterans who leave the military and relocate to Orange County are not prepared to transition into jobs. There are several reasons why: some come into the workforce without permanent housing and unmet physical and psychological health problems; often times, they may face legal and financial issues. The study states that there is no single veteran support agency that adequately addresses veterans' comprehensive needs. Casey Chamberlain, a veteran who was stationed in Afghanistan and has been living at the OC Rescue Mission's Village of Hope for three months, says he's been enjoying his training period as a cook at The Grilled Cheese Truck. His favorite part of the job is going to different places with the truck he normally wouldn't go to. So far, the truck has shown up at different churches and the OC Fair.